The first shot of Roy Andersson’s new movie, A Pigeon Sat On A Branch Reflecting On Existence, depicts a pasty, overweight man wandering a museum, studying stuffed birds in glass cases. It’s a fitting way to open the film, and not just because it puts the avian element of the title front and center. Andersson, a Swedish director with a style totally unlike anyone else’s, has the mind of a museum curator. Each of his shots— static, meticulously arranged, with both foreground and background space usually in sharp focus—operates like its own exhibit, inviting eyes to wander from corner to corner. Furthermore, the filmmaker gazes upon his human subjects with an almost anthropologic curiosity, as though they were specimens on display. At best, an Andersson shot is striking enough to be placed in a wooden frame and hung in a gallery. At worst, it’s still instantly recognizable as the singular work of the man who painstakingly composed it. Among the director’s typically cadaverous ensemble of deadpan sad sacks, a couple of honest-to-God characters emerge: two miserable gag-store salesmen (Holger Andersson and Nils Westblom), who joylessly bicker when not peddling their corny wares to a clientele with no need for them. “We want to help people have fun,” is their business motto, spoken like a mantra. On the one hand, this is a sad joke—a pair of chronic depressives attempting, futilely, to sell levity door to door. On the other hand, Andersson seems to see their mission as a noble pursuit, the time-honored tradition of using comedy to chase away despair. 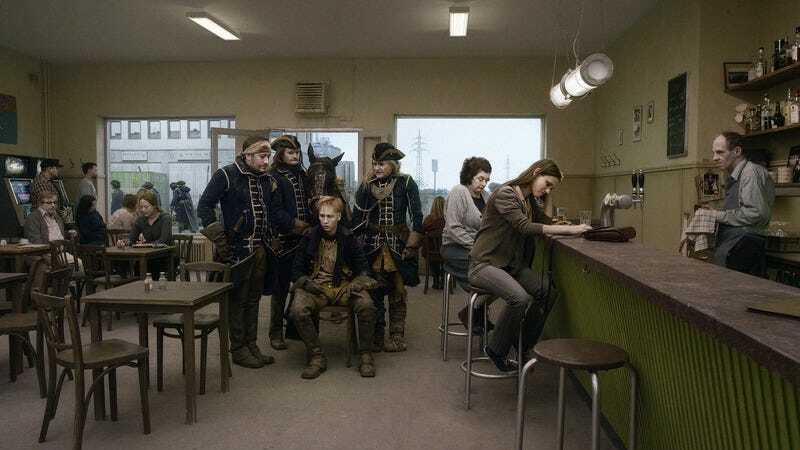 Pigeon depicts a world haunted by history, sometimes quite literally; in the movie’s most elaborate non sequitur, Swedish King Charles, XII (Viktor Gyllenberg) marches right into the present, leading his army into a modern café on the way to war. Sweden, the film suggests, is a land still fighting ancient battles and nursing ancient wounds. Andersson’s bleak worldview can be a bit much to take, frankly. A late passage of Pigeon, helpfully and cynically tagged “Homo sapiens,” finds the filmmaker making two especially withering cases against the species—one involving a woman blithely talking on the phone as a primate screams in pain from electric shocks, another involving a platoon of British soldiers leading Africans into a giant, rotating torture device, all to create mechanical music for an audience of aristocrats. That last moment, as stunning as it is scolding, is the only scene in the movie to play out across more than one shot—the better to emphasize its damning importance, one assumes. The film is more transfixing when it’s focusing on smaller, less significant displays of human behavior: little girls blowing bubbles; our two “main characters” (a term to be used loosely here) squabbling and then apologizing; a man identified as simply “Lonesome Lieutenant” (Jonas Gerholm) calling to find out why his date stood him up, as a woman—possibly his missed connection—sobs alone in the restaurant behind him. Pigeon doesn’t match its predecessors for sheer jaw-dropping ingenuity; there’s nothing here as formally astounding as the airport scene in Songs or the mobile wedding fantasy of You, The Living. In some respects, Andersson has taken this particular mode of filmmaking about as far as it can probably go, resulting in what fans of the director could (and have) identified as diminishing returns. But that mode remains so unique, so powerfully unprecedented, that it’s impossible not to get hits of pleasure just from gawking at his shoebox world, even when it’s been designed to convey some finger-wagging point about the nature of man. 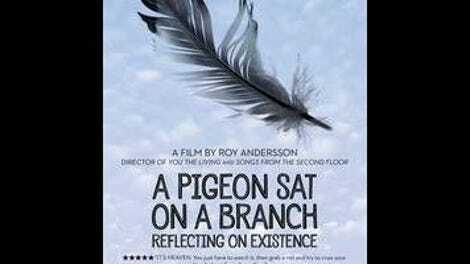 The uninitiated, meanwhile, can start with Pigeon and work their way backward through Andersson’s trilogy. It only gets better in reverse.